You've been told that bacon is "unhealthy", but is it really? Let's inspect the nutrition of bacon, and also the topic of nitrates and nitrites, HCAs, and more. As you'll see, in some cases (not all), pork fat can even be considered healthy! & guest author, Nick Pineault, aka - "The Nutrition Nerd"
Most people think that their favorite "fatty" foods, like bacon, should only be an occasional treat because they've been told that it will it will "clog up" your arteries and kill you because of the saturated fat. But as you know from reading this newsletter, the scientific community has pretty much fully agreed in recent years that saturated fat is actually not bad for you at all... and is really just a natural part of the human diet just like it has been since the origins of us homo sapiens. In reality, scientists have begun to collectively agree in recent years that highly processed polyunsaturated fats from vegetable oils like corn and soy are the REAL killers (along with too much sugar and starch, both of which also cause arterial stress if blood sugar levels are too high, too frequently). However, what most people don't realize is that pork fat (aka, lard ) is actually only 40% saturated, 48% monosaturated, and 12% polyunsaturated (varies based on what the pigs ate), while coconut oil is 92% saturated fat, and we all know that coconut oil is super healthy for DOZENS of reasons for our bodies! This isn't to say that bacon fat is always bad or good per se... it really all depends on what the pigs were fed and how they were raised . Confinement factory-raised pigs that never saw the light of day and ate nothing but GMO soy and corn based feed will have a more unhealthy fat profile than free-range pork that grazed outdoors, got a lot of sunshine (which increases the vitamin D content of the pork fat), and ate a wide variety of natural foods. In fact, free-range (or pasture-raised) pork fat can even be a really good source of vitamin D if the pigs really did see a good amount of outdoors time and sunshine...and we all know how vitally important vitamin D is for our immune systems and overall hormonal balance. Unfortunately, the vast majority of pork and bacon sold these days is from confinement factory conditions where the pigs get very little sunshine, if any at all. Yes, our grandparents and great-grandparents in the early to mid 1900's were eating pretty much 100% pasture-raised bacon back in the day, but the factory farm industry in recent decades has ruined a good portion of the quality of our foods. So make sure to look for pasture-raised or free-range pork if you decide to eat bacon or other forms of pork. At the very least, look for organic bacon if you can't find pasture-raised, because at least you know they didn't eat GMO feed in that case. But what about Nitrates and Nitrites? 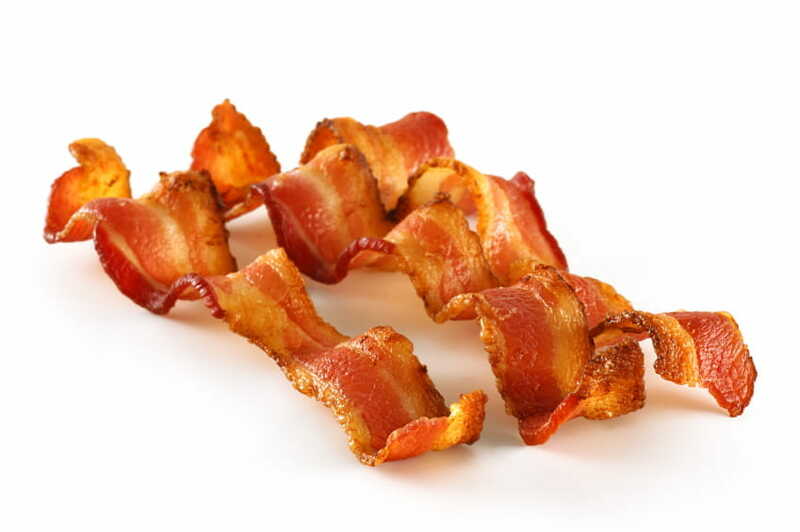 Aside from the fat content of bacon, which we just discussed can actually be healthy if you choose the right form of bacon, the biggest reason people think they need to avoid bacon is that they've been told that Nitrites and Nitrates can be really bad for you. But is that really the truth? Are Nitrates and Nitrites Really Dangerous? First of all, nitrites and nitrates are not exactly the same, but I’ll use them interchangeably for simplicity’s sake in this article. But is the fear of nitrites overblown? Should You Fear Your Saliva? And when it comes to food, I’ve got "bad" news for you. If you’re paying more for "nitrite-free" meats, you’re getting mislead. All in all, I don't think there's much difference to your health whether you get the bacon containing nitrites vs the celery salt bacon since they both yield nitrites to your body. The fear of nitrites and nitrates is overblown. There are a ton of other things you should worry about more when it comes to food, like GMOs, trans fats, and high fructose corn syrup. The fear of nitrites and nitrates comes from the fact that some of them can transform into nitrosamines while cooking. Nitrosamines are potentially carcinogenic, so that’s definitely a legit concern. But that’s exactly why manufacturers use vitamin C (ascorbic acid) when curing their meats. It turns out that vitamin C or even vitamin E (9) offers a protective antioxidant effect on the meat, and prevents the formation of nitrosamines. The reason is simple in my mind: lard from pasture-raised animals that eat a highly variable diet outdoors contains a healthier fat profile than the fat from grain-fed confinement animals. Here’s the simple conclusion... There are a ton of things you should worry about when it comes to food, but nitrates/nitrites are simply NOT one of them. That being said, try to eat traditionally cured, pastured-raised meats from local farms as much as possible. They are much healthier, and a LOT safer. Before I introduced Nick's article on whether nitrites and nitrates are worth worrying about in bacon, I discussed the fat profiles of healthier pasture-raised or free-range pork vs factory raised, and also that the vitamin D content of pasture-raised pork be as much as 5-10x higher than factory raised pork that never gets any sunshine. I also discussed that saturated fat has been proven in recent years to not really be bad for us at all, and in fact, most forms of saturated fat are either neutral for our health, or even beneficial to our health. And besides that, bacon fat is mostly monounsaturated fat (48%), which is the same heart-healthy fat that's raved about in olive oil, avocados, etc. But what about Carcinogens in browned meat like bacon? But there's also a carcinogen called heterocyclic amines (HCA's) that forms on the outer surface of meats when you brown or char meats. I've talked about how to counteract these carcinogenic HCAs in meat in this article . Since bacon is a meat that's fried in a pan at high heat, there will be small amounts of carcinogenic HCA's, but as I've mentioned before, if you're also having some high antioxidant tea or coffee with your meal, along with some veggies and/or avocado, you'll have plenty of antioxidants to counteract the HCA's in your body. I don't know about you, but I almost always eat my bacon with eggs, veggies, avocado, and some form tea or coffee (all of which are great sources of antioxidants), so HCA's just simply aren't much of a concern if you're counteracting them with a few sources of powerful antioxidants. According to Dr. Kaayla T. Daniel, PhD, CCN, "Pork fat also contains a novel form of phosphatidylcholine that possesses antioxidant activity superior to Vitamin E. This may be one reason why lard and bacon fat are relatively stable and not prone to rancidity from free radicals. " This is yet another reason why our grandparents were actually smarter than we give them credit for... they used bacon fat or butter to cook with most times, instead of today's inflammatory vegetable oils. Fun Fact about Pig Diets: Did you know that some of the most expensive pork in the world comes from a region of Spain where the pigs FEAST on almost nothing but acorns. These pigs produce meat that is MUCH healthier than the corn/soy fed pigs from typical factory farms. Not only that, but apparently the absolute BEST whole-hog barbeque in the southern US traditionally came from pigs that fed on acorns as well, and this type of pork has a signficantly superior taste compared to factory farm pork, which is sadly 90% of today's pork. It's too bad that corporate profits are the top priority of the pork industry these days, and not the health of the pigs or the nutrition of the meat. Who else wants to try some acorn-fed bacon? I'm in! If you're a lover of bacon, have you ever given the Paleo Diet a try? I know a lot of people have been lead to believe the Paleo Diet is just another fad, or that it’s too difficult to prepare simple & fast meals, or worse yet, that there’s just too much protein and fat to be healthy, but those people have been lied to. To prove just that, my good friend Pete Servold, a Le Cordon Bleu trained Chef, has created a brand-new cookbook full of delicious, mouth-watering recipes, that are also simple & fast to prepare, and for a very limited time he’s giving it away for FREE. Pete is also the perfect example of just how great these Paleo recipes are, because he’s lost over 60 pounds using them (see the pictures here)! All you have to do to get this book shipped to you for free is chip in a few bucks to cover shipping and it’s yours, and you’ll be well on your way to rapidly losing fat, boosting your energy, improving your digestion, getting clearer skin, and fighting the aging process. Please keep in mind that Pete has only printed a limited number of free books for this promotion, so you’ll have to act fast before they’re gone.